Personal Assistant Vacancies – Last Date 28 February 2019 (Srinagar, Jammu and Kashmir), Central University of Kashmir recruits Personal Assistant Posts. Candidates with Graduate experienced can apply. The detailed eligibility conditions and prescribed application form are available on the University website (www.cukashmir.ac.in). The downloaded application form is to submitted along with a fee receipt of Rs. 300/- However, the candidates belonging to SC, ST, PwD and in-service candidates of the Central University of Kashmir are required to pay only Rs. 150 as application fee. Payment of application fee shall be made online through a link available on University website (www.cukashmir.ac.in). Complete application form may either be delivered personally or sent by post to the Central University of Kashmir, Recruitment Section, Nunar, Ganderbal-191201, J&K by or before 28-02-2019. Applications received after the last date shall be summarily rejected and no further correspondence shall be entertained in this regard. 1. Before applying for a post, candidates are advised to satisfy themselves about their eligibility. No enquiry in this regard will be entertained thereof. time without assigning any reason. from the candidates shall be refunded. will be paid second-class railway/bus fare by shortest route on production of tickets. domiciles of J&K State will be given as per the guidelines of the Govt of India. competent authority and the incomplete applications shall be rejected summarily. sheet duly signed by the candidate and the same may be attached with the application. working day shall be deemed to be last date for the same. qualifying marks, experience/fees, etc. as amended from time to time. 12. The University will not be responsible for any postal delay. 13. Any change of address given in the application form should at once be communicated to the University. communications is not obligatory on part of the University. 15. The university reserves its right to limit the number of candidates to be called for interview. higher qualification and/or experience or screening test. 16. Separate application form must be submitted for each category of post. conditions associated with this advertisement. shall be restricted to the Courts at Srinagar, J&K. 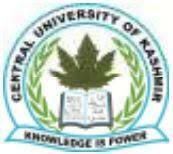 Central University of Kashmir (formerly known as the Central University of Jammu and Kashmir) was established in March 2009 with the appointment and joining of Prof. Abdul Wahid Qureshi , a noted academician and the former Vice Chancellor of University of Kashmir, as the First Vice Chancellor. The administrative office setup at 101, Baghi-Hyder, Hyderpora in May 2009 started functioning with a skelton staff engaged on deputation/ contract basis Milestones: Central University of Kashmir (formerly known as the Central University of Jammu and Kashmir) was established in March, 2009 with the appointment and joining of Prof. Abdul Wahid Qureshi , a noted academician and the former Vice Chancellor of University of Kashmir, as the First Vice Chancellor.